Hit Shot Wall - a wet month! 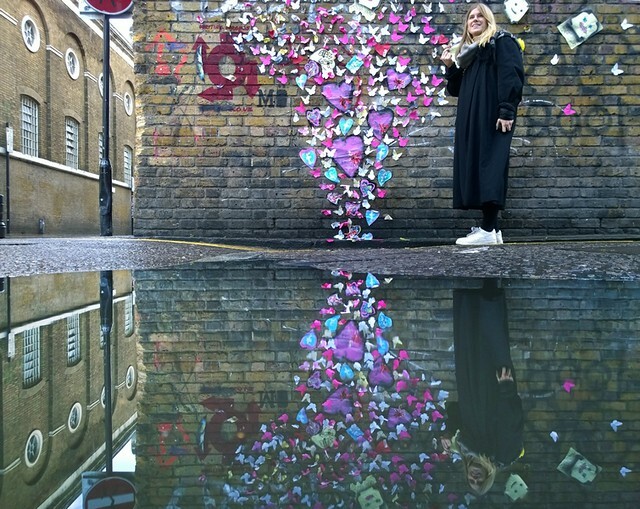 February has been a month of unrelenting street art activity by street artists clad mainly in anoraks and wellington boots. Going to kick our look back this month, a month where the elements really tested the longevity of paper based art, with a sculptural slant. 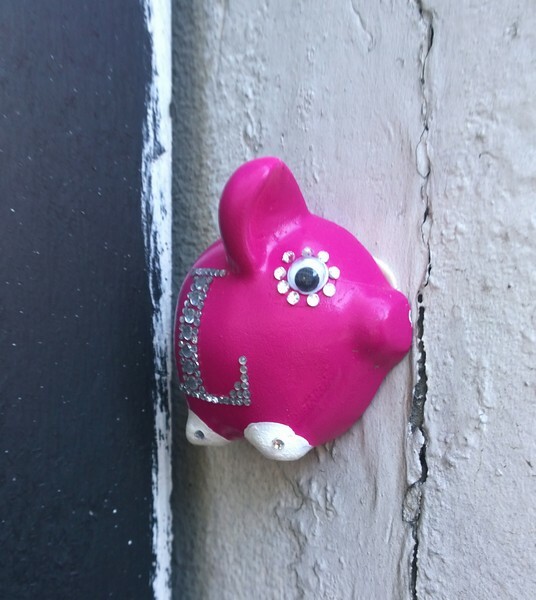 Love Piepenbrinck placed several new fancy dress piggies out on the streets and has teased us with a photo on Facebook captioned “Most Hidden Piggy – almost impossible to even photograph”, which we haven’t seen hide nor hair of. 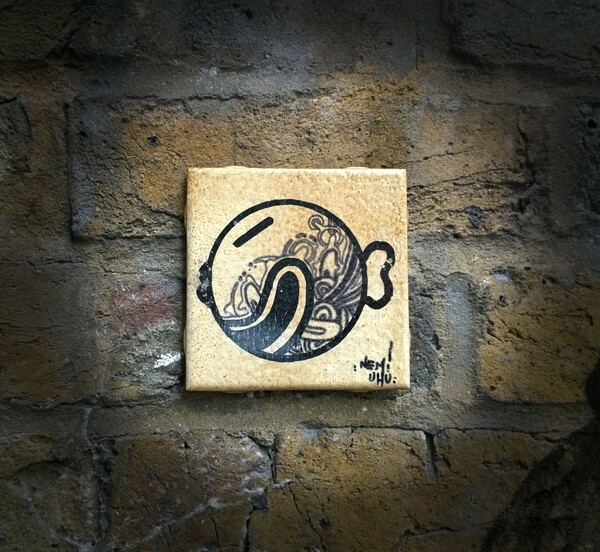 French street artists delight in showing us how it should be done, Nemi Uhu has placed a series of beautiful painted tiles on the Shoreditch streets. Another French artist who really got up on a lot of walls was Gregos, over in connection with the Vitry Ville Street Art book signing. He does these cast selfies, they supposedly show his emotional condition each day and a lot of the London ones are poking their tongue out at us, bloody French! 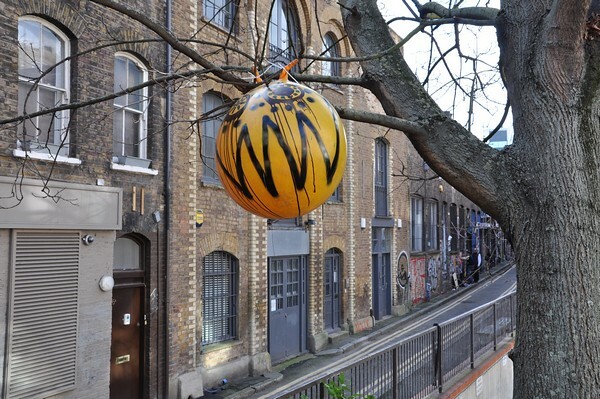 One of the weirdest bit of street art we have seen in a long while is this space hopper stuck up in a tree by 616. Not so much referencing its context as totally subverting its environment, or perhaps is it actually meant to look like an oversize orange? 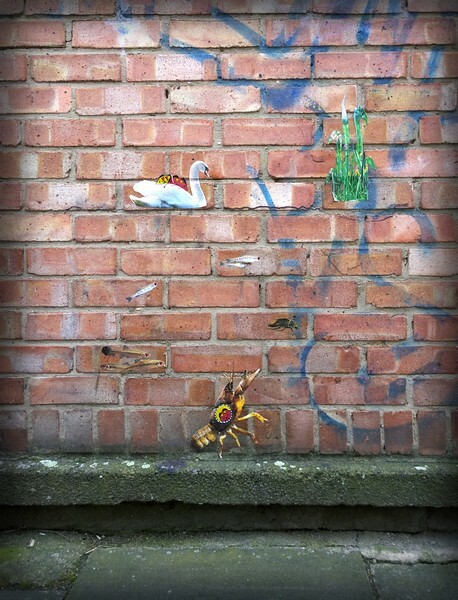 Alex Arnell believes in giving away street art and places hundreds of hand cut and painted paper butterflies on walls. 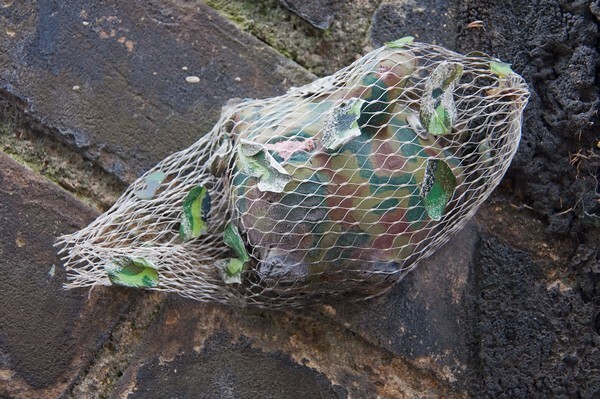 With the volume of rain we had in the month of February, Alex seems to have decided that the last place butterflies would want to hang out is down the drains and here a flock seem to be fleeing out of a manhole. 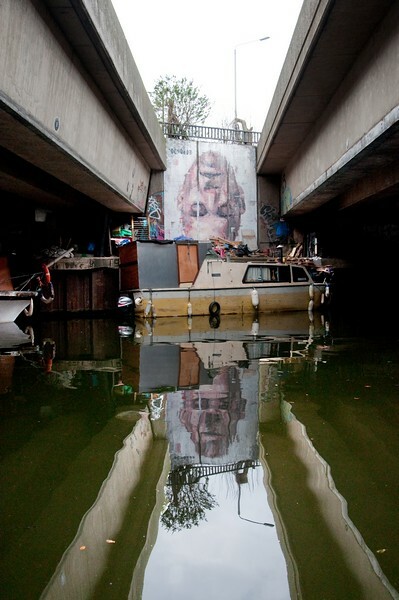 Alex Arnell aka "Sell Out"
Without doubt one of the cleverest and most exciting things we have seen this month, perhaps this year, has been Borondo’s face by the canal on Hackney Wick, already drooled over on this Borondo Hits London Graffoto blog post. 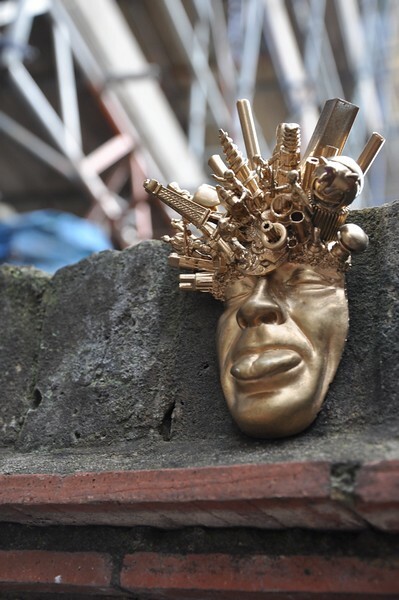 Dee One’s Heavenly Rejects have been a delightful presence on the Shoreditch streets for about a year, his minature pieces such as devils painted on acorns is often easy to pass by. One of his most pleasing and most difficult to spot is this aquatic scene. 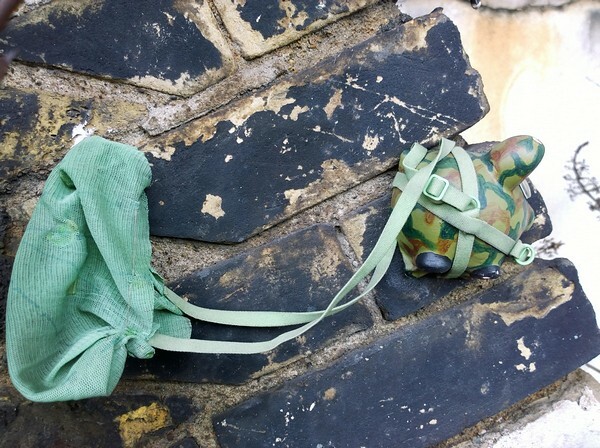 Don has been out painting the wall in February and we caught him in action one afternoon painting this girl cuddling her pet goat, once again Don comes up as about the most adventurous and detailed British stencil street artist active on outdoor walls. 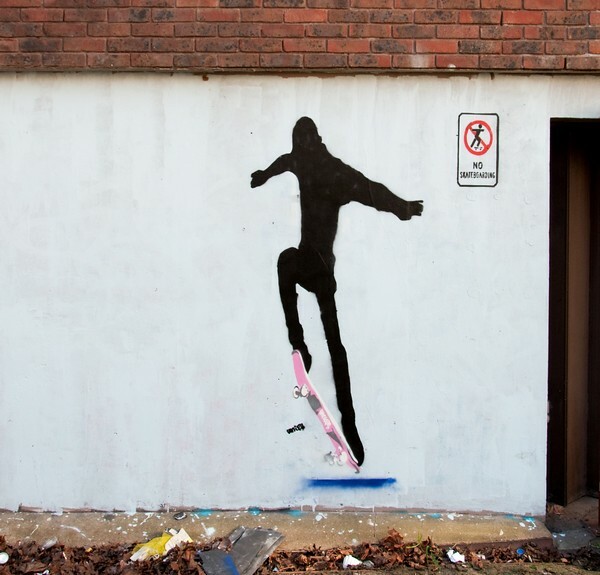 This skateboarder by Unify is defying the no skateboarding prohibition as all good skateboarders must, though if you look closely maybe not is all as it seems with the sign! With the mooted demise of the Undercroft at its current location, I wonder if Unify has dropped this one just outside the skatepark? It's begging for it. 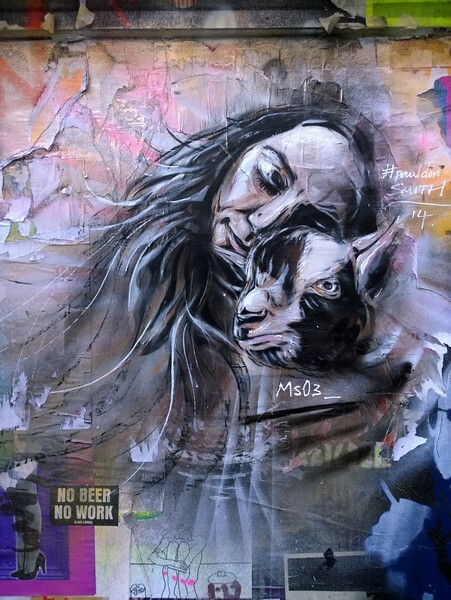 One of the most impressive and photogenic paintings in February was this little beauty by C215, over for a show (now closed) at StolenSpace. 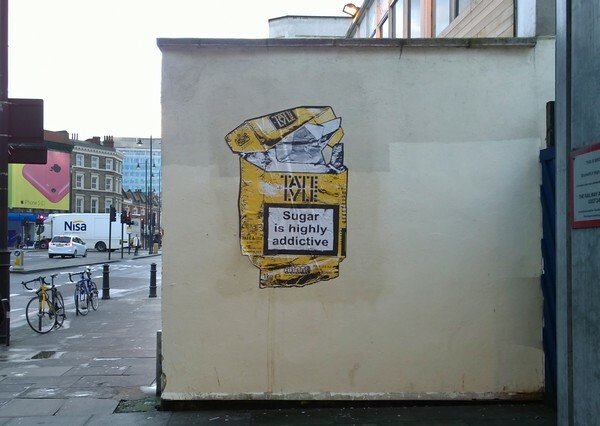 K-Guy has been busy on the streets recently, his original Tr*ash fag packet paste ups were a delight back in the early days of my love for street art and he has now revived them with this reflection on the latest health demon – high sugar levels in food. 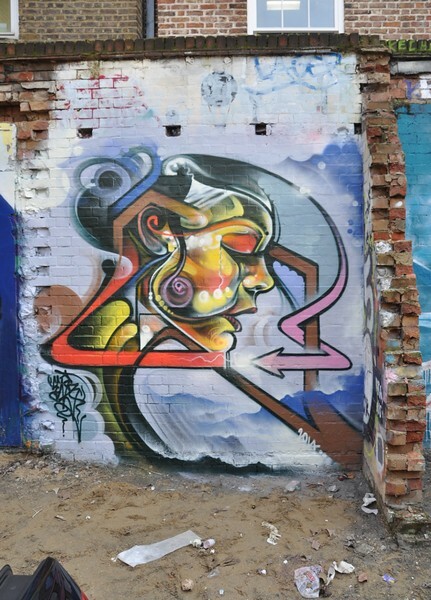 Mr Cenz has also had a highly productive month painting letters and portraits, perish the presence of all the cars in this, errrr, car park. 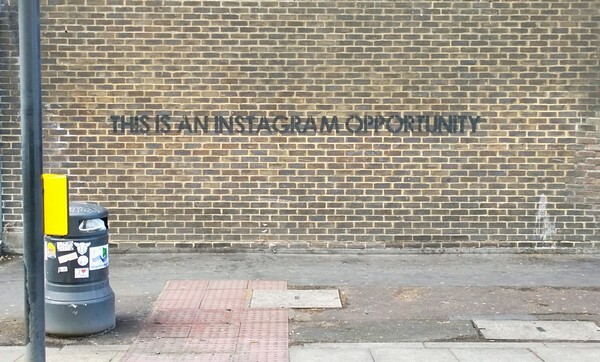 I can’t be sure when Mobstr painted this stencil but I only found it February, so because I love the humour and the ironic fun at the expense of social media obsessed street art fans, it counts as February in my time-warped calendar. Bit late this month and a bit rushed but fun as always. 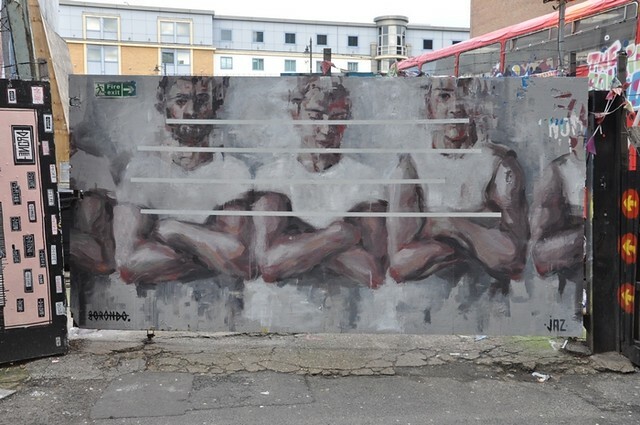 Every once in a while a street artist creates a soaring spectacular piece of street art which resets the benchmark and blows the mind, and recently Spanish artist Borondo did just that with a breathtakingly original piece in Hackney Wick. 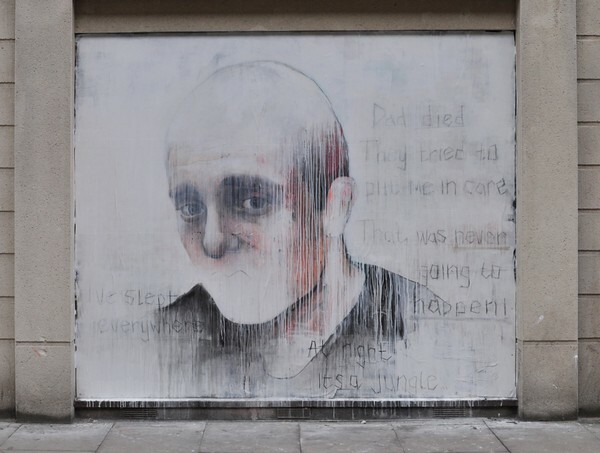 A little bit of recent history first though, he came to London last Autumn and left behind some tasty new street art. We were impressed but didn’t realise that was merely starters. 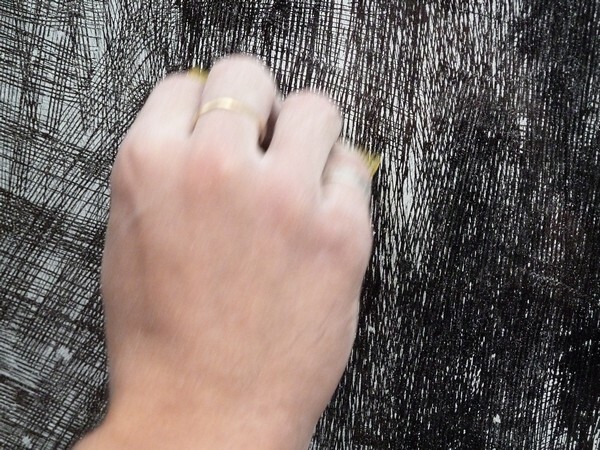 The first works we saw were shadowy sketchy figures on the outside of windows, rendered by painting the windows white then scrapping the paint off using a thick touch turtle-shell coloured comb. 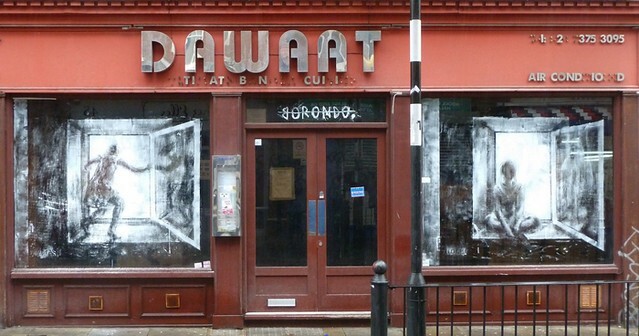 He did a set of windows on a building which has been refurbished and opened as a Mexican Cantina. At least it was last week, I haven’t yet been back today. Further up in the heart of Brick Lane he did this face. 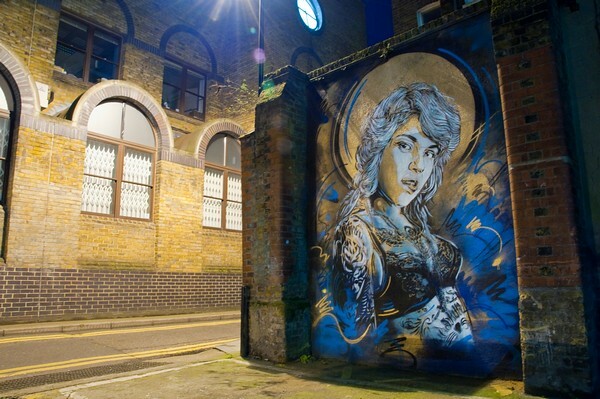 He also dropped a large mural up in old street and then earlier this year painted a gate in Hoxton alongside Jaz. 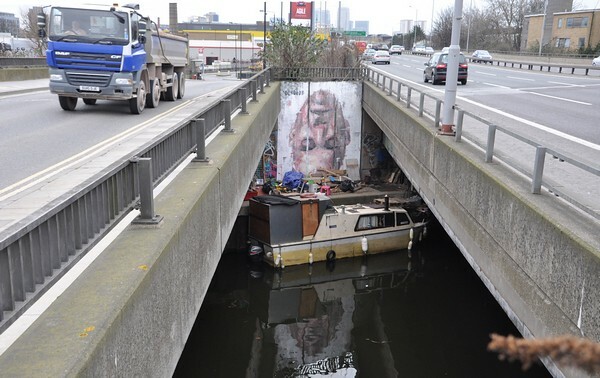 Now the piece-de-resistance,this stunning, hugely inventive and unusual piece appeared recently beside a canal in Hackney Wick. 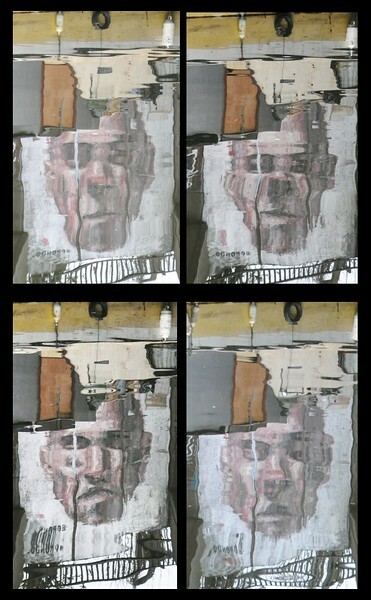 The idea of painting the face upside down so that its reflection appears the right way un is pure genius, a great example of the use of environment and context in a very unusual way. Strong winds prevailing over the past month have yielded very few opportunities to get photos of this in still, mirror-like conditions but the upside of the catching ripples on the water is that Barondo’s character becomes animated! Whatever the poor chap is enduring we probably shouldn’t pry into but there is certainly a lot of pain and distress being articulated by the poor chap. 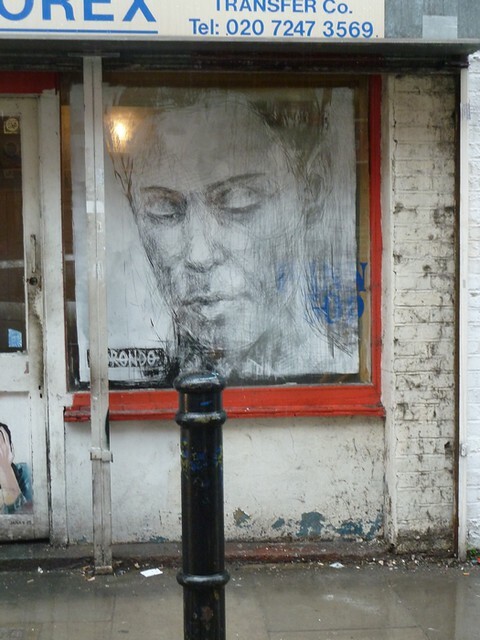 The art of Borondo does sometimes feature on Shoreditch Street Art Tours - subject to route and the art being there! 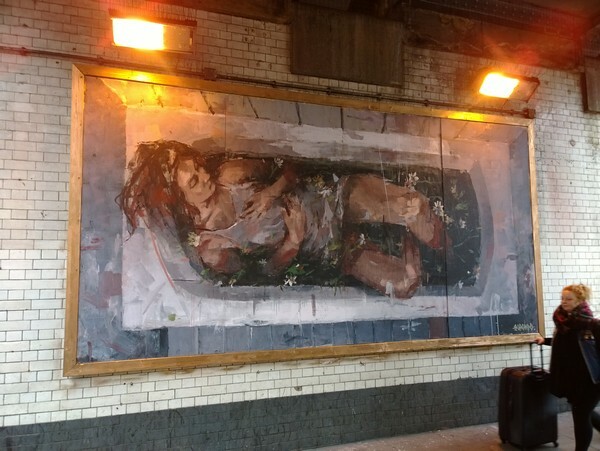 UPDATE: bumped into Borondo again this afternoon, here is a "making of" video by Fabiano Caputo of the Hackney Wick Narcissus.